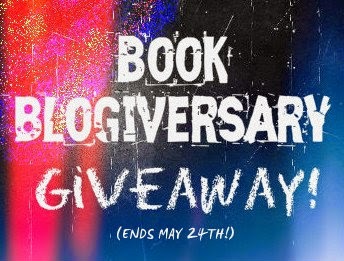 Lolaloop Books: 3 Year Blogiversary Giveaway! This blog has been around (though not always used) for the past 3 years this month! I'm shocked I haven't gotten bored with it and deleted it by now but I guess it means that my love of books continues. In honor of this blog's existence and the changes that have been made over that time (a new look, a couple of domain name changes, the addition of book reviews from my cousin, etc.) I'm going to be giving away a book! I would like to be able to give more away, but I'm paying for this myself so I have to be reasonable. The good part about this giveaway is that you get to choose which book you would like to receive if you win (from the books I have reviewed on this site)! 1. Look through the reviews I've posted since I started the blog and pick your top 3 books (I'll pick from one of those). 2. Comment on this post with those 3 choices. Leave your email so I can contact you if you win. 3. Spread the word! If you post about the giveaway on your twitter with the hashtag #lolaloopgiveaway and tweet me (@Lolaloop) you'll get an extra entry (remember to also leave your twitter handle in your comment). 4. Like my Facebook page! Liking the page gets you another entry! That's 3 ways you can enter! The winner will be chosen randomly on May 24th, 2013 (the blog's 3rd birthday). The winner will be contacted via email. *Open to US, Canada and any US military base (it counts as US because you're awesome) and maybe another country if you tell me where you're from and ask nicely! P.S. If you haven't read them yet, The Hobbit, The Fault in Our Stars and The Shining are among some of my favorite books! Updated: This giveaway has ended. To see who won go here! I think there are certain people who need to get a life, and stop trying to dictate the lives of everyone else and their children. The majority of the “banned” books are and were respected and valued by my generation (X), as well as the generations before me, and the majority of us all turned out fine. I hate to say this but, Generation Y and Z have been coddled for far too long. And what has it done for them, other than make them a bunch of whiners? No offense to those of you in my immediate family. ;). There were times in the past that were not what I would consider “The good old days”. Slavery, women not being able to vote, segregation, etc. were all part of our history. We have learned much from our history and no one should take this important learning experience away for the younger generation. Because I love it when lovely women such as you promote the reading of “banned” or “challenged” books, so that they can come up with their “own” opinion on them, rather than having to be force-fed the opinion of idiots. This sounds like an extremely good book and I need to read it!! I was pretty upset when I saw this giveaway was US only but you did mention that if asked nicely you might consider it. I'm from Sri Lanka and I'll send you cupcakes( i.e virtual ones)!! So please, please, pretty please am I entered into the giveaway? I loved The Book Thief, Looking for Alaska and Ashfall form your review list. They look great. Oh I followed your blog via GFC and on Twitter too. Oh all powerful and ever gracious book reviewing blogess, please have pity upon a reader from Canada who doth hope to have a chance at winning a book to treasure and read while she doth attempt a wily escape from the great Monster of Unemployment! I am deeply shamed to have never read this classic. I own the movie but have yet to read the (what must be) much better book. Apparently, I never want to sleep again. I have liked your Facebook page and tweeted your giveaway. My twitter handle is @CoffeeKris and Facebook knows me as Krissy Whasserface. Good book choices! I checked out your blog & I liked your letter to Felicia Day. She's awesome (I loved The Flog on Geek and Sundry)! P.S. Because your post was so awesomely funny & well written I'm giving you an extra entry... because this is my blog & I can! OOOH, I knew those 4 years of intensive Shakespeare would pay off! Take that everyone who ever mocked me English/Theatre degree! Glad you liked my blog, I like your blog. Have I used 'blog' too many times in this sentence yet? BLOG. This is such a nice thing to do. Three years of blogging is a lot of work. I Like'd your Facebook page, am now following you on Twitter (@LMcCJ) and Retweeted your tweet about this. If I win I'd actually be happy to read anything I didn't have to pay for! My choices would be: The River of no Return, Let's Pretend This Never Happened, or A Discovery of Witches.